Published July 30, 2011 By Anna T. This post may contain affiliate links. Regardless, I only recommend sites I've researched and/or used and trust. Asurion is the company that many people call when they're having mini-emergencies. You know … car broke down, need a tow truck or some type of rescue. Cell phone suddenly lost or destroyed, contacts gone for good. Computer completely crashed in the middle of something important. When these things happen, a lot of people call Asurion to help. And guess what? You can be the person on the other end of the line, coming to the rescue of others while working in the comfort of your very own home. What is Asurion work from home pay? The pay at Asurion starts off at around $11 per hour. This is about the same as most other phone jobs at home. Also, I'm reading that you can get lots of overtime here, so that is great! You must be based in the U.S. In addition to that, Asurion only hires people in certain areas of the U.S. This changes from time to time, so I suggest you check this page to see if they need anyone near where you live. Not in the US? I have some tips that may help you find worldwide work at home jobs. Do you need any special qualifications to be eligible? You just need either a high school diploma or GED equivalent. Previous customer service experience is also a plus, but if you haven't had it, don't worry, you've still got a shot. They will train you, and another plus is that the training is paid. Asurion is a work at home company that offers benefits!! You are hired by them as an employee, not an Independent Contractor. So you can get medical insurance, dental, vision, 401K, life, employee assistance plans, you name it. Training is paid, and from what I've researched, it only happens at certain times. Not exactly ongoing. So if you are hired, you might have to wait until the next training period occurs before you can start learning how to actually do the job. Because people have emergencies at varying times throughout the day and night, there are a lot of different times you might be working. After you are hired, your trainer will go over your schedule with you. Weekend work and working six days a week instead of five is pretty common. This might not be the job for you if you don't want to work that much. Are you looking for a job without such strict scheduling? Here's a list of flexible work at home jobs. PC only. You also need DSL/Broadband internet with a hard-wired landline. You also need to get a headset that you can plug into a USB outlet. Asurion does not want background noise, and again this is typical with most customer service jobs at home. What are the Asurion work from home reviews so far? I read some threads on the Work Place Like Home forum where lots of people claimed to love Asurion. They said the training was wonderful, the trainers were helpful and informative, and they loved the work because it's so rewarding to feel like you helped someone through an emergency. I didn't really read any complaints on that forum about working for Asurion. However, there are some reviews here on Asurion at GlassDoor that you should read over. There are some employees who aren't all that happy with things. One complaint I keep seeing is lack of flexibility with scheduling. It's best to get all sides before applying to something. You can apply by going here. If they contact you and you are hired, please come back to this site and post below about your experience. I strongly encourage you to read through the comments below before applying. I've had some amazing readers come back already and post about their experiences. Extremely valuable information has been posted down there that you should for sure read if you think this may be the job for you! Useful post ! I was fascinated by the insight , Does someone know if my assistant could find a fillable USCIS I-9 copy to use ? I did not read everyone’s comments so I’m not sure if the question was already answered. I read that this would be a virtual interview and telephone. Does this sound familiar to anyone? Just want to know if I need to spruce up a bit and be ready for the camera during an interview or is it just by phone. into a system to attend classes? Who knows what you will be doing week by week? I have a 2nd interview monday…Just wondering what kind of questions they asked….I hear its 45 minutes long. I did all of the paperwork, everything complete, bought phone, computer passed scan ect, and I get an email 5 days before I was to begin (June 1, 2015) stating that my background check did not pass. Well I have a HUGE issue with this because my current job that I was leaving conducted a 31 year background check on me and I have what a bounced check from years ago and that is it, so there has to be some sort of error. I was flabbergasted when I got this news. They did state that they will send me the results in the mail and I have 5 days to appeal it after I get it, which I sure will. I am wondering if they do a credit check? If that is the case, I would have never applied. I had Interview with Supervisor yesterday spoke with a recruiter who asked me a few questions before scheduling me with a supervisor. I feel the interview went well. She was very nice and said that I will receive an email letting me know if there will be an offer. I have not received an email yet. I’m thinking tomorrow. How good are my chances? Does anyone know if they normally call if you are offered a position? I had a interview on Thursday with the Supervisor, was offered the job on the spot and then received a call on Friday and was offered the job again. Then I received a email the same day also, containing the first round paperwork. I was offered the job Friday she said she would send everything via email that we went over and my offer letter but she didn’t , she said if she didn’t send it Friday it would be Saturday which is today and I still have yet to receive anything. So Monday I will contact her and see what’s going on. Well I finally completed my online application with Asurion today, because when I first applied, they wanted you to have a camera, so I never completed my application. I saw an ad on indeed.com, read it and it didn’t say anything about a camera, so that is when I decided to complete my application. After I completed the few questions and uploaded my resume, it took me through a series of questions and then prompted me to complete the assessment. So now I play the waiting game until I hear from someone. Will be checking my email for a reply. Wish me luck! Will update when I hear something. I got a offer with direct TV. My start date is may 4th. The paperwork is a lot but I’m almost done with that. I have worked at home for a phone ,internet and TV company before so I’s sure that wont be a problem. Anyone else starting on May 4th ?! Are u guys ready ?! Also Any updates from anyone ? well I just had my interview with an supervisor, said that I should here from someone within 48 to 72 hrs. I hope everything works out great, if so I will be working on the directv project. Wish me luck. Also can anyone tell me what type of headset do you have to buy for the actual phone. Hi Meika how is the process going for you can you tell me a little bit about your experience and how long did it actually take to get your acceptance letter after your interview. Hello guys, I applied march 10, had 2 interviews March 13 & March 16th , waiting on the reponse, I checked today my job status and it is under review /archived, That means I got rejected? I did not got any email yet. Hi wilhemina, I just got done with my paper work. My training class on the 23rd. Yes they offer split shift. My schedule after training is 10:15 am to 2:15 pm. And 6:45 pm to 10:15 pm. I have a interview today with the supervisor and was wondering if offered the job do they offer split shifts. Hello everyone, I received my offer letter early on Tuesday morning. Now I have to make sure I get all my equipment is in place in order to receive the next round of my paperwork. Hello everyone, I did my application on the 28th, an hour later received an email to take the assessment test. The next day I got an email for a virtual interview. The day after a phone interview. Yesterday I had an interview with a supervisor that took 45 mins. She said she will forward my info to HR and said I should hear something in 48 to 72 hrs. She offered me the position. Are they open on Sunday? I’m getting over anxious. @MSBLACK congrats on getting hired!!! do you know your work schedule? Hello I just got hired with asurion I had two interviews. The first is basically with an recruiter who goes over your resume. Secondly I had an supervisor interview for about 30mins it was really quick and simple and she was really really nice. I start training class on feb 2 for insurance claims. I completed my application yesterday evening. This morning I received two emails (auto i think) one for the assessment and the other for 1st interview. I just completed my assessment which took an hour. I’m getting ready to do the 1st interview now. I just wanted to let prospective applicants know that the whole assessment was geared towards taking customer service calls for Direct TV. Let me know if you have any questions. so i have a conference call with Asurion today and am very excited?? My name is Cynthia and I just got hired with Asurion on the claims side. My training starts on 10/6/14. Can anyone tell me what are the break times? Is it after two or three hours? For the computer requirements, if you’re using a laptop, do you have to connect a wired keyboard and wired mouse or can you just use the laptop itself?? I know the Internet needs to be hard wired and no wifi! does anyone know what company they use to perform background checks? Sterling is the name of the background check company I think. My start date is Sept 29. I will be answering for DirectTV. All the paperwork was a little crazy at times but thankfully its all over. I cant wait to hear more about the employee incentives and bonus opportunities! I am scheduled for a group interview, does anyone know waht that means or been thru it by chance? Thanks! ms.James, I’m sorry to hear about your difficult experience. Are you still with Asurion? I will begin with DTV on Sept 29. Do you mind sharing the other work at home job you found? Are they still hiring? Thx! Has anyone ever been hired with a felony? Some questions that was asked was: What was a time that I had to deal with a angry customer? What was a time where I had to fix my schedule for work or personal? What was a time where a co-worker ask me to do something that I didn’t agree with and how did I handle it? Those are the only ones that I remember. I was asked a lot of different questions. Well my very first interview on the phone not the automated one was just a basic one asking questions about the job and things about me and past jobs. My interview today overall was good but I’m still very nervous about the process, he said I would hear back within 48-72 hours with a response so I’m waiting and praying tomorrow I get the email. Have you had interviews or been hired I did my 3rd interview today and they said that they would email me within 48-72 hours. I’m nervous and needs answers about the interviewing process. Hey. Did you get hired? I did one interview with hr and one with a manager and noq they said they email me in 1-2 days, today being the final day they said they would contact me by…. My interviews seemed to go really well, but the second interview was only 30 minutes, and they said nothing about a third interview. I hope I hear from them. Whose recently been hired to asurion ? I applied for asurion on August 8th and when I check the status it still say under review. How long do it take for you to hear something? Do anyone have a number for asurion? Applied for Asurion on 8/24 got the email regarding an invitation for interview on 8/25 received the 1st actual call on 8/26 which is currently today. Got invited to do another interview with a supervisor for tomorrow which will be 8/27 so everything is moving very quickly but I’m very nervous about the next interview. I will be starting the directv project if I’m hiring starting at 9.50/hr. Has anybody gotten hired in the month of August? Any info on directv training and actually taking calls. & also can you use your laptop for this position? I just applied today…finished the online assessments…when will I hear something? Any clue? I really think this is a great opportunity and I have enjoyed reading everyone else posts! Hi, I am going through the process now. So does the I-9 come after the background check and drug test. How lond do you know if everything is alright? I have done my first round paperwork, whats next? You get two 15 minute breaks and an hour for lunch. I believe it’s 6 months before you can bid on another shift, if one becomes available. It’s 60 days for benefits except DirectTv you get after 30 days. They will have a benefits meeting the first week think we had ours on Wednesday, and an HR person will explain everything to you. If you pay attention in class you won’t have any trouble with the test. They really do want to help you learn it all and want you to ask questions if you don’t understand anything. I start training classes on August 4th for the DirectTV project. I would like some input from anyone that is currently in or recently finished training. I received the email today with details on the available schedule after the training period. Do anyone know how long is the waiting process for new schedules? The three options were one straight 8 hour shift and 2 split shifts. I also start training on August 4th. The class atmosphere is good. The trainers really want you to learn and will help you all they can. There’s a lot of sharing screen so they can see what is going on and walk you through the steps if necessary. They have several different classes (different trainers) going at once. So when they do the Benefits information you will be in one room. How long before employees are eligible for benefits? Are the weekly tests hard? How many and length of breaks do you have during training? @Carolyn Thank you , I am pretty excited. So far everyone that I have spoken with have been wonderful. I know I have been through 2 tech checks on my computer before starting and everything passed. Even added more memory to my computer just in case. I think the hardest part of the process was finding a notary for the I9. @Carolyn thanks for the insight to the training class. How is the overall atmosphere of the course? I started with Asurion on the 7th with the DirectTV side. From my understanding the nesting starts on the 4th week. There is a lot to learn and a lot of test. I think we had around 9 this first week. You have to have an overall score of 80 to pass. If you pay attention you’ll be fine. We did start out with 17 in the class and now there is 14. I think though, it was mostly because of equipment problems. Not sure since the trainers never mention it. Hello I have applied for Asurion I had two interview the second interview the lady told me that someone will give me a call in a few days I would like to know how long will it take for someone to get back to me. hello everyone. I found this website after i initially contacted asurion for employment, however heres a snapshot as to how its going. I contacted asurion the july 3rd and took the online assesment, got a An Invitation to Interview on the fourth. had the recorded phone interview on the seventh. I then had my first interview on the eighth, (although i had started recieving calls from asurion an hour after the email was sent but it registered as 00 on my phone and it was rejected). Had my interview with a supervisor on the following day the ninth, attended an acceptance conference call on the eleventh(although i recieved the invitation 2 hours before the scheduled call, so check your emails frequently). Hi everyone I am so excited I found this thread! I start on 7/14 with Asurion doing the DTV side. Can anyone tell me a little bit about the 6 week training, when will they start nesting us during the 6 weeks ect. I want to be prepared LOL. I will say I am super excited, and am hoping that the technical side will be easier than when I worked for Dell :S and at least I get to do it from home! Is anyone else starting training in the 14th ? I start training on Aug. 4th. I would love to hear about your experience so far. EBoni don’t quiet look @the perks of working from home, did you get paid for that time? maybe time in half? No I did not get paid any holiday pay or time and a half. What type of drug test do they do and how long in hiring process?? IM super nervous I have my final interview today with the supervisor, just trying to see what to expect with the drug test process. Never mind, I got it a little bit ago. Hope everyone had a great 4th. I start training Monday the 7th, but I have not received anything telling me where to go for the class. I know it is virtual, but the tech told me I would be getting an email from trainer with details, which I haven’t gotten. Should I just expect something between now and Monday? @Jaime…It was just offered by hr but um ticked off because i was told that working holidays were required but out of everyone in my class, I am the only one that worked on both Memorial Day and 4th of July. My sup says it may be the fact that I am off on Thursdays but that is not true. If you had off one one holiday, you should be required to work the next. And I do not get holuday pay just because I had a computer issue a few days ago. Needless to say, I am looking at other opportunities. I will stick it out until I find better but this is insane. Good luck everyone. C Davis the DTV side pays $9.50 there is some up selling you have to get 10 per monthly and you get extra money on your check, over time always offred and im on split shift 10-2-7-11pm I don’t like the 7-11pm due to im not a night person. you get free DTV after 30 days there actually a lot of perks that come with it. Its a bit challenging if not use to the technical side. Do anyone know if third shift available? Or the latest shift time? Hello everyone! I have read everyone comments/posts. Very helpful. I wanted to know if working on DTV side pay is more? Most tech support jobs pay more wanted to know the rate of pay for DTV? I was recently hired for the 7/14 class. I will be working for Att. I was womdering @Eboni if you got the split shift hours during a shift bid? I noticed that you had a different shift at first. I have 130-10 during the weekdays. But, was really interested in the split shift because, of my kids. @DJohnson… I am on a split shift now, so I have a 5 hour lunch break. Great for making time for running errands and everything. You can’t just ask for a split shift. You have to request it as it comes up and from what I was told, I was lucky because they only offer that like only a few times per month…. so just try to plan your day. It will get better. I did get my headsets FINALLY lol my start date was suppose to be on June 16th but got a call that same morning telling me they had switched the start date for June 23rd. As far as I was concerned I was going to be doing claims..which is what I wanted to do…but as im reading these comments I notice that alot of you start the June 23rd but for dtv :/ I did not want to work on the dtv side 🙁 is anyone else starting June 23rd for claims?? Please tell me SOMEONE is..I reeeally dont want anything to do with dtv. Give you a heads up. Document everything!!! I was marked absent for an attendance issue when I was having issues with citrix. I was on the phone with tech support at the time of the incident. Had I not called the help desk and got the ticket number, it would not be good. Document everything. If you are not sure of something, always ask. Do you work well and you will be ok. I like working with Asurion. On the claims side, there is plenty of overtime so that is great. So if you want overtime, take advantage of it. Show up to work on time, do your job, and you will be fine. @ms.james I start working with the DTV side on June 23rd. I realize that training is six weeks. However, on July 14 and 15th I am scheduled to have some renovations done to my house where the power will be out. I have planned to stay at a local hotel where they have WI-FI. This has been planned for a few months now and it can’t be postponed any longer (electrical issues). I’m just wondering if the training requires you to actually use your phone line and or be hard-wired to the internet. At the hotel, I would be able to access the internet through a wi-fi connection but not my phone line. Any help would be appreciated! Thanks! @Vanessa, did you get your headset straightened out? I didn’t see where you had to have a usb headset, just one that needs to be connected to the actual phone line. No cordless phones. Hello, just checking in to see how everyone is doing with training or interview process. I start my training on Monday, June 16, which I am very excited. I saw that Vanessa starts on June 16 also. I am going to be working with the Direct TV side of Asurion. Hope to “see” you there Vanessa. I love being able to read everyone’s experiences so far. The only advice that I can give to someone that is going through the process is when you get to the I-9 portion, my local bank would not notarize the I-9. I went to a local UPS store and they were able to complete these forms. The cost for me here is NC at the UPS store was $5 per page they had to notarize which ended up being 3 pages total. So roughly $15 plus tax. Good luck if you are applying. So far it seems like a good company to work for. Hello! Applying to Asurion was VERY easy. I applied online and then within 48 hours received a request for a “pre-recorded” phone interview. This consisted of a series of about ten questions. There are a total of three interviews including the “pre-recorded” phone interview. Then, if you are offered a position you will receive an e-mail offer letter. This e-mail provides some of the information that you may be curious about, however it left me still having questions. This e-mail invites you to participate in a phone and computer conference call. You do not need to have your home phone or PC computer set up when you do this. I did this from my cell phone and my macbook. Then, during this conference call they review the specifications for the equipment you will need. This is followed up with another e-mail which details the forms which you need to sign and return. There is also an I-9 form you will need to get notorized. (Most local banks do this for free.) Then you will need to scan back your forms within 48 hours of them being sent to you. They will also follow up with another e-mail asking you to choose a start date and a shift. They have been very kind as well as flexible so far. I’m very happy with the hiring process. It’s very easy. @Vanessa you won’t receive any info about paychecks until you start. its not done through a form. all payroll and deduction options are complete through the intranet. U will need two different headsets. u should have received a email that tells you a list of acceptable headsets one for usb and the other connects to your phone. @ Keisha what will you be doing with sprint? @ Eboni my trainings paid us for memorial day, check your time sheet, mines was on there the very next day. Im actually on the Sprint project. I love it so far. Congrats @Keisha.. you may be listening in to of my calls since I do claims for AT&T lol. Work hard and you will be fine. @msjames, I think it starts on Saturday that is why we must finalize our timesheets each Friday. I did work Memorial day but I will see about the pay when my paycheck come next week. Hello everyone, I started on Monday and I must say I love it so far. Everyone is so friendly and knowledgeable and really wants you to suceed. It depends on when you came in during the pay period. When I started on April 21st, I was paid the next Friday since it was the last week of the pay period. Next paydate is on June 13th so if you are not working right now, you will not be paid until the next pay date of June 27th. Things have been tough lately due to the system going down a few times but I can handle it. I have over 10 years of experience so that didn’t bother me. Congrats to everyone who were hired and good luck to those who have applied! I am sorry that I have not been on lately, but I have been so busy. Can’t believe it’s been just about 2 months since starting. Tikoya, during the application process, they asked if you’ve applied in the past 6 months, so I’m under the assumption that 6 months has to of passed before you can reapply. But, there are other call center jobs that you can apply to. It depends on your residence, job skills and recruiter, but I’d give it a try. I applied for the position yesterday (6/2/2014). I went through the assessment and pre-interview questions. I’m not as technologically inclined as my husband, but I have several years of call center and customer service experience, so I pray it’s enough. I’ll come back when I find out more about the position like some of you did. Please, wish me luck. It is greatly needed!! @dana it depends on if you come in middle or beginning pay period. WE came in last week of pay period so I got paid following week. I-9 they will give you a list to choice the ppl in your city who knows how to correctly do the process.Its long and you cant go to any one unless they know Asurion process. Ms. James wow you’re going to be busy! I’m so upset with comcast. I have them for home phone service and they are taking forever to take off my call waiting. Every single time I call its the same old thing. They say they did it already but its still on my phone! uggghhhh and I have had to reschedule the tech call once already. Anyone else experience this? Well We take 1-2 calls but today Sunday we will be taking calls im thinking all day! WE work 6 days until next week then I start my regular training.! Pay nice, its a lot but we have to get used to it. Some supervisors, say they been with DTV for 1 year or since 2012. So maybe you can learn it and move up. Some say once we learn he system we will get faster and used to it. Hello How much the pay rate for DTV if you are ok with sharing that information? @msjames…how did the first day of calls go? I swear that I get the craziest calls sometimes. I just shake my head and move on. After all, it’s just a job so I don’t let the negativity get to me. wow I wish I could get free direct tv lol. Mrs. James its ok to feel nervous you will do great. Just fake it till you make it. @ ms.james Seems like you didn’t have too bad of a day! I can’t wait to start training. The Directv cable for free sounds awesome! Do they make you pay for the equipment/cable boxes? or do they just pay your monthly bill? lol took my first call today for customer who wanted to connect Genie Go. Lol the guy said you seem like you don’t know what you’re doing? In my mind I thought uhh you are right lol but the call needed to be transferred any way. @Keisha… if your supervisor says it’s available, yes it is. He or she will tell you how to apply for OT. Eboni just curious is overtime offered. Congrats at Yadi! Glad to see that you are doing well! It is a great place to work. To be able to work from home is awesome! I have been with Asurion for over a month now and I really like it. I will be starting my second month soon. Keep us updated! @Keisha.. that is the project I am on. It’s pretty simple, but can be stressful at times. My supervisor told me that the next 4 months will be the busiest. Get ready to work. @Rashelle, there is no way of knowing how many calls you take until the end of each day. I have taken over 80 calls today alone. But be prepared to work. @Tikoya, I don’t see why you can’t apply again. Someone has posted the human resources number on this board. Give them a call and see how it goes. Good luck! @Eboni. I will be working on AT&T. Hi i’m just wondering how long before I could re-apply for the position? I didn’t get it on the first try but i will not give up! 🙂 In hopes of working for Asurion!! We are closing in on training and going into nesting in the next 3 weeks, Next week we get our log ins. I have completed all my required test and with my supervisor I got an 80 which he told me was good. My hands hurt im tired I been testing all day the best part is im off on Monday.! Huh I got offered another job @ Uhaul for at home agent! I may just do both! lol We shall see. @Keisha.. I am currently working in claims and it’s pretty easy. Which project will you be working on? @ Mrs James I will be working in claims but it really wouldn’t make me any difference. I have over 10 years experience in sales, technical support, and customer service. I really don’t know im almost at end of training, calls will come back to back Im sure! How many calls should we expect on a normal work day @ ms. james? Insurance claims are a little easier but it is stressful . I have over 10 years of experience so I let that roll off of my back. If you are scheduled to work on holidays, you work but you will be paid time and a half. Asurion is great to work with. With the shift bid in a few months, I will switch again since my son will finally go to kindergarten. It will be easier for me to work during the day time. We are all in this together so make this work everyone. Have a blessed day! And congrats to everyone who were hired! @Keisha are you doing DTV? Or insurance claims? Seems like Eboni only one who will be less stressed lol. I just was told that we have another mid final exam this Thursday or Friday. sigh… Then next week we take a few live calls then last 2 weeks we take live calls as a mock trial! WE shall see.! I really would have preferred the insurance claims, im going to be honest. Good advice Eboni. @ Mrs. James. You will Do just fine. I used to do technical support. Customers are usually patient. Congratulations to everyone that just got a job offer. I start on June 2nd. I’m so happy. Got my start date! June 23. I could have picked a sooner date, but the schedules were better later. I’ll be working 2:45 to 11:45pm with thursday and fridays off. Looks like after a few months I will be able to participate in shift bids if my percentages are up. I’m scheduled for training July 4th. Do we get federal holidays off paid or just get paid more for working? For those of you that have been taking calls, about how many do you get during your shift? Congrats @DJohnson on the job offer! You can do it @msjames… You came this far, don’t stop now. I can’t believe that I have been with Asurion for almost a month. I can’t say that I have any regrets. There are good days and there are bad days. That comes with every job. But if you go in with a positive attitude and do your best, you can’t go wrong. I guess I got lucky with the insurance claims side. I am looking to be a mentor and then eventually, a supervisor. I will get there for sure. I do apologize for not responding for awhile, but I have been so busy with the job, I haven’t been able to respond to post here. To those thinking of applying, go ahead and try it. Asurion is a great company to work for. To work from home is a blessing. Have a great day everyone! I forgot to add its getting a little better, yesterday may 16th we had our first evaluation and mid term test! lol and we had to do a mock call with supervisor, it was ok. WE had 4 test to do in 3hrs. she said with agents scoring the highest level is 18 im at an 15 right now. so we shall see. If this was just billing I’d knock it out the park but its not. Its technical support/billing/ a tad bit of sales. Only 1 thing you have to sale and that’s protection plan. So im trying as we get on the phones maybe it will become easier we shall see. @ W grayer and @ D.Johnson upon completing your 1 hr welcome session then they, the tech guys have to check your computer make sure you have all the requirements. make sure you pay attention to the work and details, I have worked with customer services well over 6 years, but doing technical support is something new to me to be honest. But we wont only be doing tech support, it will be billing, if cust tv is out and need to fix to their DTV receiver we have to do that. Its so much we will be doing. Once you learn the steps, and as time go on then you can better understand. I have already started training. It’s an 8 because im not used to tech support and since they don’t want you in the material after class to study , only way to know is to pay attention. And volunteer for them when asked so you can learn. that’s the best I can really say to be honest. After training, do you get to choose the schedule you work out of a few options or do they just tell you what you will be working? @msjames haven’t gotten the start date yet. I got the offer through email and will be doing the acceptance conference on Monday. So I guess they will tell me then. Is it getting better for you? @ms.james can you tell the stress level from 1 to 10 and I’m referring to the work load. I’ve been in customer service for 8+ years so rude customers will not be a problem. Also will you tell me your training hours? @djohnson its about 1 in half. Get ready lol pay attention when do you start with DTV? Thanks Eboni!! I got the job! Received my offer and have to do the conference call. Ms. James looks like I’ll be on dtv side. Anyone remember how long the acceptance conference call was? Congrats! Conference call is for like 10-15 minutes unless people have questions. Pretty simple! Hi Eboni how has your first week out of training gone? @eboni Thanks for the info. you too ms. james. One last question. Is your training in Sterling VA @Eboni? I’m trying to see how far the drive will be for me from maryland. The training is virtual so it will be at home on your computer. Eboni this DTV is a lot to learn you get lost im not a quitter but not passing these 2 test today really made me sad. I really want to pass they said its based on test and participation! you’re is very easy something’s not easy to learn on DTV. I currently work for dtv in a call center. for over a year and half now. Im hoping I get picked for dtv. DJohnson, I am in VA and I do insurance claims. My training lasted for 3 weeks and I work every Saturday. You will get an email regarding your schedule once you are hired. Ms.James, it will get better. At least you get 6 weeks of training. I am already in production, but it’s ok. It’s like I have been doing this for years so I am good. admin note – email address deleted for your protection. I have my third interview scheduled for tomorrow and hope and pray I get it! Just wanted to ask a few questions. Is anyone in MD or VA? and do you have an option to work full/part time? Seems like everyone is getting full time hours which is great. Does your schedule change sometimes? Like if you’re working saturdays a while will it ever switch to sunday? Im in VA , and im stil in training this is my last week and i do have to say so far I love it!!! Is there anyone doing DTV now? or is at the end of their training? Hi just an update. It gets easier I promise. The more you do it, the better. I love this job. And I get to be in my pajamas. I hope things are going well with everyone. Good luck everyone! Hey ladies how was you all first call taking? @ Eboni, M schedule is 1:30-10 and 12:30-9 on Sundays. I have over 5 years of call center experience so it cant be as bad as working for the actual cell phone company. Thanks for the heads up for training. Congratulations on your graduation. I have already passed the testing and tomorrow is graduation day. @Lakeisha, you will love the phone claims. Very easy and simple. You do get grumpy customers, but that’s with any job that deal with customers. Training is for 3 weeks so I suggest you pay attention. For the most part, you will be in class training for a week. But on week 2 and over, you will be on live calls. Practice makes perfect. What is your schedule? @msjames… well I love taking calls. You get good customers, and then the bad ones but I’ve done this before so it’s nothing new. I just didn’t like being rushed during testing. I will tell you, my class has started off with 18 people. We are down to 13 now. @ Mrs. James I’m going to he working on At&t project for phone claims. Good luck! You will be just fine. its a lot to learn but im ready! Great news I received an offer and I start on June 2, so excited. Thanks Eboni! I had my virtual interview earlier and I have the last interview today. I’m a little nervous. so thanks for the encouragement. Good Luck Chaun! I hope you find something. I know what its like not being happy at a job. Sorry for the typos but I was using my phone when typing this. Hope that everyone who applies gets the job and good luck to everyone! @ms james…yes I did get paid. I startrd during the last pay period. @Chaun..congrats on the baby! It is a great job with benefits and just like anybjob, you get out what you put in. I am able to work from home and be with the kids so that is a plus. My graduation from training is this Friday so I am excites. The job gets easier as the days go by. Good luck! Hi @Eboni how is it with the children around while working? How are old are your children? Are you able to keep them quiet? Well we will be doing billing tech support and little sales nothing big on sales! I have done multi things on my last job so im ready! I am in my last week of training and I did find out that since I am scheduled to work on Saturdays, I will only have one day off this week and that is on Sunday. I love the job. It’s very challenging but is worth it. I get to work in my pajamas so that is a great deal for me. Training is great, co workers are great and you will love it. Good luck to everyone! When did you find out your schedule for the position? well hard work with at home jobs is what im used too! I work with West At Home on a project with Dominion Gas! and its billing, payment plans, payment receipt verifications, we reconnect customer services set up work orders for meter inspections, and the biggest one is Listening to the wonderful customers curse you out lol! This what im used too its work but I have mastered all of that ive been with them for 6 years and I cant move any where else but up and that’s with asurion! Your hired for what job you applied to. There are two different career pages. They both look alike so its easy to get them mixed up. The phone claims jobs are listed on http://www.asurionforce.com and the Direct tv jobs are listed at http://www.asurionathome.com. I made sure that I applied to asurionforce because I did some research and figured out that is the site for the phone claims. If you go into the job description, they are different….but yes direct tv makes you do everythinggg smh. I guess what you could do is apply on the claims side and wait for them to contact you but you would have to let the direct tv side know that you don’t want the job. I’ll be honest with you, if you have a job you like already, I would stick with that until you find something else because the direct tv side is no joke from what I hear but I encourage everyone to make a judgment for themselves. Hope this helps! @msjames, I do not think you can switch. I guess that I got lucky with being assigned to cell phone claims. I graduate from training next week and I am excited. For the most part, we sign into our class and have a brief meeting. We then go onto the phones and take live calls until the end of our shift. I do not mind it because by the time that I am done with my training, I will know what to do. I am actually being trained by my direct supervisor and she is very nice and helpful. 3 weeks go by so fast. But hang in there. You get to work frim home so that is a plus! Thank you so much for your comments. I have my second interview today and my third tomorrow. I hope I am I hired. I have a job. But with the money I spend on gas and lunch its cheaper to stay at home. @veata do the training last all the way until 7pm? what do they talk about the first 4 days? does anyone know if you can switch to another training job like insurance? @veata that is a lot and I really wanted to only stay with tech support and that’s what we was told initially. I do billing with west at home.com and I needed a break from billing. sigh… what else did u learn can you keep me updated. do we get paid 2weeks after training or 3weeks? Im in my 4th day of training with Asurion for Direct tv and I just found out we will be doing billing, tech support, selling and other stuff. I would rather be with one specific department but we will see how this goes. It seems like a lot to learn, but training is 6 whole weeks so maybe it wont be so bad. that would be a very good idea eboni I thought about that using my marriage certificate, im in Atlanta, so each time I have to have my papers notarized its $30 each or $15 each time she has to come BACK out. so we shall see today training starts Monday may 5th. I will keep you updated later on! Have good day.! It’s Homeland Security. They have been tough since the new ID laws. It’s crazy. I couldn’t even use my SS card because you couldn’t see the red seal on the card. I am 32 years old and you can’t get any more original than that. Thank goodness I had my birth certificate with me. It is a hassle but the job is great. I think to be on the safe side, you should have included your marriage license so that they can tie the names together. Hoping for the best@ ms.james! so I sent in my notarized ssi card and state id last THRUSDAY, today I get an email saying that my last name on the ssi don’t match what’s on my birth certificate. Well my id has my married name and my SSI card has my maden and married name hyphenated. they want my original birth certificate. im confused both my names is on the social security card. Im married now. she said because people do fraud and can use their children ssi card! HUH? if you have my ssi# and you’re looking it up there governmental system ALL my info would be there where I lived now and past, schools etc. Because some ppl use their kids ssi cards? again HUH? @Marie.. I have several bilingual reps and they are paid like $1 more. I have finally taken live calls. It’s really easy. I had to shake off my nerves but I know that tomorrow, it will be better than today. Stick with the training. It is tidious, but it is worth is in the end. The company is great to work for. Excellent training, benefits are great. I am able to work from the comfort of my own home. I can’t complain. Good luck everyone! Hi everyone! Wow, this thread is so helpful! Thank you…. This question is for Yadi or any other person that knows about the bilingual pay differential (stated on the job post). How much do bilingual reps get paid? Thanks! The pay for bilingual reps is 10.00 p/h must be able to pass a bilingual assesment, which is very simple ! That I don’t know@Amber, but if you google Asurion at home, you should be able to find something there. If you didn’t get the email that comfirms the receipt of application, I would give them a call. I believe there is a number and I saw it on another form, but don’t remember when. The recruiting number is 866 740 4376. Hth! @msjames I agree..@Yadi congrats! You will get lots of hands on experience and everyone are so helpful. I am beginning my 2nd week of training tomorrow and I can’t wait. I can’t believe that next week is my last week of training and then I am on my own. I am not scared or nervous at all. I like how training is so organized and the amount of professionalism is great. You will love it! I meant to reply to your comment initially but, I ignorantly used my MacBook to complete the application process for a work from home position and it worked fine but I didn’t receive any email stating that they received my application as other companies typically do. I wasn’t aware that you had to use a Windows PC to complete the application process, I thought it was just for actually working there. I thought about going back and completing the application over with my husbands’ Toshiba but I don’t want to annoy them by seeing my application twice. Is there a number to call to ask someone whether they received it or not. I searched but could not find one. If someone knows, I’d appreciate you for life! haha! thanks! I am glad i found this site ! It gives me more confident of the job I am about to begin I was just browsing to see if there were any good reviews from the work from home position I should be starting as a Bilingual rep on May 12 2014 and I am exited as i am currently a bilingual agent for a collection company and it is very agonizing not being able to help people but to tell them they have to pay a past debt. Not so satisfying ! I just got the papers for the drug screen and I will have the tech check my system on May 2nd hoping i pass that !!! I am extremely exited so please feel free to fill me in with details of what I should expect!! What company are you currently working for? Good to hear eboni! @ niesha nope don’t give up, it may not be that hard! and working from home is best! If we train together we can email each other for help! I am glad that it worked out @ms james. @neisha, don’t give up. The job economy is tough. Take what you can. I had a great time in training this week. Lots of one on one time with the mentors and supervisors. Our classes will be on the phones starting next week and I am excited. Finally ready to put what we have been practicing for. And listening in on calls are great as well. I’ve learned so much. Will update again once my training is over. Can you give me more info on how its going ?? I start training on may 12 ! okay well I had a notary from their list come to my home, I was just wondering I remember them saying color. but we will see what happens no I wont have problem with any homeland security im usa! lol . It was easier for her to do it. @niesha why are you reconsidering? don give up because of the training or because of the lock down hours? I will tell you…. the I-9 process is so difficult. I thought that by going to my notary at my bank, it would be easier but it was not the case. She couldn’t go on the computer and do the I-9 electronically. I had to go to another notary. From what many classmates of mine have said, you can go to your local UPS or FedEx stores and get it done without issues. My copies were in black in white and I scanned them at home after having them copied and notarized. But it’s worth it. It’s not Asurion, it’s the Department of Homeland Security. Asurion participates in E-Verify and they must be strict in regards to checking and making sure that only people who can work will. @ms james it’s every 2 weeks but your trainer will tell you everything. one last ? lol how is the pay every 2weeks how do they calculate the pay period do we wait a full 3weeks or? Thanks eboni! For the update! Lets Get It! Update for everyone. As you get further into training, you will be doing more calls. Well mock calls that is. That way, when it’s time to actually take calls, you are comfortable on the phone and it will be come second nature. I was nervous the first time but then it flowed as the time went by. After the mock calls, I felt as if the calls were actually real. I feel confident that I will do well. Pay attention in class because you will be quizzed daily. Stay active. Ask questions. Those things will make you stand out for the best. Trust me. For the most part, I process cell phone claims. It’s really easy and will only get easier as time goes by. Can’t complain, especially when I finally have a work at home opportunity that is legit, pays, offers health benefits and 401K. I can see Asurion as the place that I will be employed with for a long time. Good luck everyone! I start may 5th too! lol im doing the I-9 process and notary lots of paper work! Oh okay I start 5/5 did you start already? that’s why training is weeks direct tv and insurance claims agents training is 3 weeks! niesha we just have to pay attention lol no one in this chat is on direct tv so I don’t know exactly what happens. But if we focus im sure we can pass. I would have preferred less work lol I always get projects that’s stressing lol. insurance claims would be better . When do you start? I work for directv in a call center. I like it. just don’t like the commute. @ ms james So if you dont pass the test then what they drop you? @niesha I’m doing direct tv and its for 6weeks, I was told that it would only be tech support, not billing lol not something I want to do as I currently does billing with the westathome.com, I wanted a break from billing lol. when I did my initial interview I didn’t realize I wasn’t going to do Verizon insurance claims which I would prefer to do to be honest. But get ready because there test we have to past with in test. and for direct tv agents we are pretty much on lock down with our hours, for sure. you will have to do things in between the hours given to you, life and weekends will be re adjusted lol for sure! Get ready. @Niesha, from what I’ve heard, DirecTV is the more difficult side. But the person who commented above my last post has been hired for that project with Asurion. Let us know how it goes. @Just Me… I have started my work at home position with Asurion and I love it. Very professional, organized, the supervisors are super helpful and knowledgable and I am having so much fun. I actually started yesterday. My training is for 3 weeks and I am doing wireless claims. From what we have been doing, it’s pretty simple to do. You will get it, just be patient. If anything, the negative people are probably from tech side but there is not one company on the planet to whereas 100% of the employees are satisfied right? 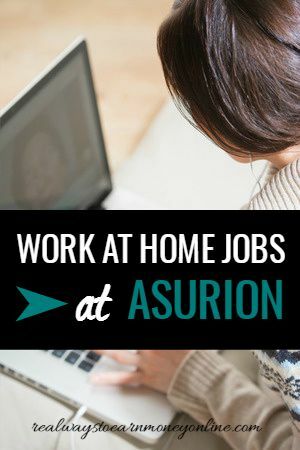 I have worked for a few work at home companies and by far, Asurion is the best. The discounts and benefits are great and you can start earning for paid time off on the first day of hire. @ms james.. I love it! I am so glad that I made the choice to be a part of Asurion. We get two 15 minute breaks and one hour lunch daily. Overall, I have no complaints! Tell me how everything goes with you! And I agree with you@Jan! @ JUST ME You will get it, I work from home with west at home.com I have only read a few negative reviews, but what job is perfect. My current at home job don’t offer anything, no 401k, insurance,healthcare, pto, NOTHING! Im looking forward to Direct TV with asurion learning what I can learn doing it right and making money.! what @ home agent you work for? @eboni did you finish your first day and how was it? did it last till 7pm any breaks in between that 10-7pm? I just had the recorded interview with Asurion for the wfh position. I am a little nervous as I work from home for a call center now and I’ve read reviews on other sites about not being happy working for Asurion. I hate to leave bad for worse! Any updates from anyone that took the job? Most of the negative reviews are on the tech support side which used to be New Corp. New Corp is now part of Asurion, they handle the Direct tv side. The wireless claims side of Asurion is the easier of the two. Only 1 week of classroom training and a week of nesting. The Direct tv side is about 6 weeks and they pretty much want you to do everything, tech support, sales, billing, etc. The claims side is pretty much filing phone claims which is definitely a lot more easier. As well as the schedules are better for the claims side. They usually get one weekend day off. On the Direct tv side, most people have to work both weekend days and evenings. So it really depends on what side you applied too. Hope this helps! hi eboni I did get the job im waiting for m drug test to come back I’m sure I will pass. I start my training with direct TV on may 5th. that gives my other @ home position 2 weeks notice. I know you start yours Monday April 21st? do you know what the test will be like while we doing training? I heard there is test with in test, do you have direct tv or Verizon insurance? When do we get paid 3weeks after training start or 2 weeks? this seems like a good position, im currently working with West At Home, on project with dominion over the last 6 years, they offer you no benefits the way asuroin does. I hate to leave but I have to do other things to reach my personal goals! Hi Niesha! Congrats! My training starts on Monday. There is a lot of paperwork to do but it’s ok. Just pace yourself. I have a Windows 8 computer and the scan turned out well. When does your training start? Don’t forget to complete another user on your computer with “Asurion”. It is required before you tech walkthrough. Hello eboni I was wondering how was your training going im getting ready to fill out my papaer work today and waiting for the computer scan which im nervous about but I have windows 8 but hoping my processor meet up to their standards. Sorry to hear that you didn’t get the job Hannah. I hope that you get good news soon. Ms James, I went through the same process. If you are chosen, you will receive an email. It’s been 6 days since you’ve posted. Any news yet? does anyone know if I will lol or been threw this process before? I’m trying to figure out when the training class starts for the satellite support class. Can anyone answer me that? I REALLY want to quit my current job, but I can’t do that if it’ll be a long time before the class starts. That’s assuming I get hired of course. Keep us posted Hannah! I was hired a few weeks ago and my training doesn’t start until April 21st. But time is going by fast, so it will be here before you know it. Well, I didn’t get the job. No idea why, I have excessive related experience and I thought I did well on the interviews. Oh well. Good luck to everyone else. Congrats and good luck Timika! I will find out the pay period when training starts. I will post it here. @Janelle M. The hiring processing took me 8 days in total. After filling out the invitation, the page opened up for me to do the assessment. It took 72 hours before I received any news. I got a phone call stating that I should call someone about more info. From them, after speaking with the recruiter, she scheduled me for an assessment, which was basically listening in on some phone calls. Being vocal and paying attention to detail really helps. From there I had my phone interview later in the evening. I had a feeling that I got the job but I didn’t want to get my hopes up. 48 hours later, I received an email offering the position to me. And from what I was told, I will be handling wireless claims, which is great. I say give it about a week more. Good luck! And thanks for your kind words Anna! Hi Janelle M! Well, the recruiter will call you and give you more information about the position and ask you a few questions. It’s pretty much like a mini interview. And then, if he or she feels like you would be a good fit, you will be scheduled for the next step, which would be listening in on some phone calls. From there, if you are still interested, you will be scheduled for the next interview. Good luck and let us know how it goes! So I got the nerve and called the number lol. The guy said they had received my application but the resume wasn’t attached even though it says it was smh! Well he asked me to email my resume to him and would give me a call back. He called me back and did a basic interview and said he was moving me to the next step. He set me up for a virtual share and another interview right after the virtual share. The virtual share and the interview went well. I have over 5 years of call center experience so I’m used to those type of interviews. I had examples for dayyyyss to give the interviewer lol. She was really nice and said that they are actively hiring and have training classes starting every week! So she said I should hear back by Friday(today), or no later than Monday. I’ve been checking my email and looking at my phone all day! I was hoping to hear back today but its getting late so now I’ll be anxious all weekend waiting for Monday to come…..smh lol. Eboni did you receive a email offer or did they personally call you? And if you don’t mind, what state do you live in? I’m in North Carolina and I heard people say the I9 process is hard….were you able to easily find someone to do your I9? Thanks..
Hello everyone! I am so excited that this thread is still alive! I have completed my second interview yesterday and am waiting for call today @ 11pm eastern time from a manager for my 3rd interview. I feel as though I will get the job. I have read every comment on this thread but haven’t been able to find out what days would we get paid? I wonder how the pay period goes. Does anybody know?? Update! I have completed the drug testing and background check so I am cleared to go. My schedule will be from 1pm-10pm EST during the weekdays and from 12:30-9:30pm on Saturdays, with me being off on Sundays and Wednesdays. I am fortunate enough for me to get a job with benefits, especially with this ObamaCare and with the economy being the way it is. And as far as Saturdays, what I can’t do on Saturdays, I can do it on Sundays. At least I won’t be stuck in traffic, I am not wasting money on gas. The beauty of working from home! Now I have to do a computer check and have the system set up on my computer on Monday, but other than that I am excited. My training starts on April 21st so once I am done with training, I will post another update on what happened during that time. So happy to hear things are moving right along! Congrats, Eboni! Hey Eboni that’s great! I have a question, how long did it take after you applied and took the assessment to get a interview or email? It’s been a week for me and I don’t even know if I passed the assessment or not. Also, I noticed that they have two different positions. One dealing with wireless claims etc and the other one deals with Directtv troubleshooting billing etc. I hear the wireless claims is the better option of the two. Which one did you get hired for? Thanks in advance. Hi! Just got an update. I had a phone interview on Wednesday evening. It went well because I just checked my email and received an email saying that I am moving on to the next step. Now I have to listen in on the conference call today and make sure that I have all of my equipment requirements completed before my training class on 4/21/14. I am very excited!! Great news, Eboni! Good luck! Thank you Anna! I will keep everyone posted with my progress soon! And I am so glad that I found this page! Do you know which project you’ll be working on? I’m trying to figure out when the class starts for the one I’ve interviewed for. It’s satellite support… like for TVs and stuff. I am supposed to have a hiring decision today or tomorrow. No news yet though. Well, I have applied for the Asurion Work at Home position on 3/11/2014. I got the call 2 days ago to set up an appointment for the Virtual chair to listen in on some phone calls. I had the phone interview this evening and I was told it would be about 45 minutes. My interview lasted for 1 1/2 hrs so I am not sure if that is a good sign or not. I was told that my info will be forwarded to human resources and that I should hear back from someone within a few days. Is that a good sign or not? I have almost 2 years of call center experience. This job would be perfect for me, especially since I have school aged children. Any insight would be appreciated! What kind of background checks do they do nationwide or just state wide please help!!!! they use sterling. i think its statewide background check. does anyone have tips on the I9 process. They make it seem so scary. I had my third interview Friday, January 31st with Asurion. It went and the manager said she was very impressed and would forward my information to human resource. Anyone knows how does this process take? Do they call you back from a private number to offer the job or a number from the carrier on which you will be working with. When I went on my 2nd virtual interview listening to calls one manager said they next training class was with Verizon and a Verizon called me today 2/4/14, I called it back but I couldn’t get through. Any had this problem? I had an interview today I thought it went well , but I’m wondering why she didn’t schedule me for a second interview?? She said that she would foreword my information to a human resources and someone would contact me . I feel like that meant I would not be making it to the next step. I have plenty of experience and 10months of working from home . Just curious! Hey Guys, just sent back my paperwork to Asurion. I’m going to be in Feb. 17 class. Worked at home before with Convergys/Directv.-This seems a little less complicated. Wish me luck. I’ll update on my progress. When did you interview? What carrier will you be working with? How did they contact you? Did call to let you know you had the job or emailed you? I know I got a lot of questions but I just need to know what going on? I applied at asurion, just had an interview today and goign for a group interview friday . I got sent an online assessment , was a process wehre it tells you what to do and you get 2 trys, was 27 questions but It then loged out , is that all there was to the onlien assessment ? Does anyone know how long after you take the 3 assessments after the third interview does asurion let you know whether you have the job or not. I know that this is an old thread..But does anyone know if Asurion is just an off-shoot of NEW Corp? Or are they merged? They have two different websites. It says that NEW is an Asurion company.. I thought they were one and the same, but now I don’t know with the two different websites and all. I noticed the same thing and I think there must have been some kind of merger because it wasn’t set up that way before. However, I believe you could apply from either website as long as they both have the application link. I may do an updated review, or update these old reviews with what’s going on if I can figure it out. I am wanting to apply for Asurion’s at home position and was wondering if anyone who was hired with Asurion has a Mac computer or should I have to buy a regular Dell computer to do the work? I just checked the job description on the main website and under tech requirements it states that you do need a PC running Windows. 🙁 So sorry! There are so many of these companies that are just not Mac-compatible. I will update the job posting with this information so it helps anyone else wondering about it. Hey I have a few questions. What kind of calls are they? Like handset claims, or what? On the background check how deep do they go? I know some companies that check employment education etc and it takes forever. Not sure on the background check, but I would suggest applying anyway just to see. Maybe they won’t go that deep with it. This doesn’t sound like one of those jobs where you’re privy to a lot of sensitive information, so that might make a difference. They work with insurance for roadside assistance, handle cell phone insurance claims, work with directv, have some people working with centurylink and verizon.. They have legs is a whole lot of different companies doing a whole lot of different things.. I start training this coming Monday! I am am excited. However, they give you less than 2 weeks to purchase your equipment. I didn’t have the money up front for it, but thankfully, my boyfriend helped me. The techs downloaded all the systems that will be required and I am so so sooo excited. It did take me a minute though to find a notary. I hope everyone has good luck with this company. For it to be an at-home CSR job, the pay is fine with me. Especially since you can get OT and all. Hi Christi, so, they want YOU to buy your own equipment? And they pay between $10 and $12.00 an hour? What happens if they let you go? Lay you off? Hmmm. And how has it worked out for you? I would really like to know. Thank you. How far back did they ago? Hello I just wanted to know were you accepted with your background? I am looking to apply for this company but I am facing the same problem. Hello all. I have went through the interview process. Personally, for me, I only had one interview phone call. It was the same for me as far as the STAR method. It went very smoothy…I was then sent an email for links doing random technical questions about PC and Direct TV. After completing the test I was sent another email I would say 3 or 4 days later with the job offer stating that I was done with the interview process and they would like to offer me the job. They set up a phone call for today to go over “paperwork.” I am assuming this is the proper tax forms since they stated I was done with interview process. I was also listed dates to start training and a pfd file listing the shifts I could choose from. So am I to assume this is the final steps heading into training? I only ask because it is July 4th weekend and I have plans, which I am willing to cancel, to give drug screening? I was not told about background checks or anything. I guess these proceedings vary from each applicant and that the background check and drug screening is not guaranteed but rather done randomly due to cost? Anyone knowing this would you please get back to me and thank you! Oh and so far I have had nothing but a positive experience with NEW. Is the pay really 9? How are so many people happy with this and supporting a family on less than 360$ a week? Crazy!!! Applied to Asurion using their online application on 4/8/2013 as an At-Home Customer Service Team Member based in Colorado. Had initial phone interview on Friday April 12th, 2013. The call lasted about 20 minutes. She told me she thought I’d be a good candidate and scheduled an interview with a hiring manager on Tuesday 4/16/2013. That call lasted about 45-50 minutes. They typically use interview questions using the STAR format. S -Situation –what were you trying to accomplish? T -Task – What was the goal or target? A –Action –What action did you take. R –Result –Describe the outcome. At the conclusion of the interview the recruiter stated the hiring managers would be meeting later in the week and when decisions were made I would be contacted. Exactly one week later, 4/23/2013. I was sent an offer letter contingent upon completing a drug screen & background check. I begin virtual training May 20, 2013. They’ll re-check system properties and speed of the computer that will be used and I’ll have 2 tech sessions prior to the training start date. What type of drug test did they do? and how far into the interview process did they do it? does anyone know who i can call or email. I got a call from asurion last week but when I call back all I get is a voicemail. The person hasnt returned my call. jus got hired today for the january 14 class i am so exited. Thank you Debbie! And good luck! i had my first interview today and the lady told me that i should heard from them by next week and that the training class is the 29th of this month. i have my first interview tomorrow i am excited and nervous at the same time.can anyone tell me what is the first interview likeand what type of question do they ask for, i just want to be prepare cuz i really need a job, any advice would help. Hey, I am really excited about this opportunity! I have repeatedly tried to submit an application but can’t get past the computer scan for some reason. It boots me off of the browser every time I try. Then a message will pop up that says no jobs are available. Has this happened to anyone else? I’m desperate! I am so glad I found this website. I applied at Asurion on the 19th and had my 1st interview today and scheduled for the 2nd inteview Tuesday the 26th. I’m excited, just getting the interview; was beginning to think I would never get hear from anyone. I have had all the interviews and the last lady said she was going to tell them yes to hire me but they had just started a training class and it may be a week before they called back and I still have not heard anything should I be worried or is there someone I can call and talk to. I am supposed to have a second interview, but I’d like to know if the company pays for the drug test and background check, or will I have to pay for it and if so around how much will it be. Mike, the company pays for both. You don’t have any upfront costs unless you need to purchase some of the equipment needed for the job . Hi, i have my first interview tomorrow im kina nervous just wanted to know what is the first interview like what type of questions do they ask. Any advice would hel. I was just wanting to know how long the hiring process takes. I called asurion friday night and had a interview on the spot with a recruiter. This recruiter said that he requested that they hire me. He then set me up for a second interview and this was a senior recruiter that called me and this senior recruiter said that it was not an interview and she asked me a few questions and then told me about the job and emailed me a list of requirements for phones and headsets. She then setup for another interview with I think another recruiter it could have been the manager im not sure. When that person called me they said the interview would not take an hour. He then asked me a lot of interview questions and then told answered any questions that I had. He then stated he was referring me to the next step in their hiring process. I asked him what the next step was and he said they will call you to extend an offer of employment to you. He said someone will call me but he did not know when they would call me. It could be the next day or it could be within the next couple days. He said the next training class started at the beginning of april. As of today I have not heard anything from them. I am wanting to know if anyone has had this happen to them and how long it took for them to call and extend an offer? Did anyone with the work at home position have to do a face to face interview or was it all phone interviews? For anyone wanting to apply with Asurion that is not in one of the areas listed, employees are able to refer people from anywhere, and they will hire in most places that way. If you’re interested in having me refer you, just send me an email to theresa.franks @ asurion.com with your full name, email address, home and cell numbers (if applicable), and a short paragraph about why you’d make a good customer service rep. If you’ve got call center experience, that definitely helps, but any job where you have contact with the public will also count for customer service experience. I do get a referral bonus for referring anyone who is hired and works 90 days, but this does not affect any of the things that I post about the company – I just post my experiences truthfully. Hope to hear from some of you that would like to get on with the company but are outside of the areas listed!!! Ok, time for my one month update. I know this is long, but I wanted to try to touch on as much as I could. Training is 3 weeks, but the classroom portion is only 6 days. Toward the end of the 6 days, you do some role-playing to get you ready to answer calls, and then on the 7th day, you’re on live calls, but at first, you share your screen, and one of the mentors is right there to see what you’re doing and what is showing on the screen to help them answer any questions you have. From the third week on, you take the calls on your own, but you’re never actually alone. There is a knowledge area where you can look up the answers to most questions you might have, and if you can’t find the answer there, there is a chat room where you can ask your questions, and any available supervisor will help you. Your supervisor is also just an IM away. The amount of assistance available is amazing when you consider you’re working all alone in your own house. Most of the calls themselves are pretty straight forward, with customers just wanting to file a claim or check on the status of an existing claim. You do get people who are upset about the deductible, the replacement equipment, or other things, but you have materials available to help you explain these things. Anytime a customer asks for a supervisor or gets really irate and threatens to leave their carrier over the deductible or any other policy, you transfer the call to the resolution team, so you aren’t required to handle those really, really upset customers. There are a few different ways that you are rated on how well you’re doing. The first is your average handle time – you are given a goal, and you do need to be within a few percentage points of the goal. They do take new hires into consideration, though, with your goal being higher for the first couple of months to allow you to get comfortable with the scripting and getting through the calls more quickly. Some of the calls seem to go on forever, and you’re afraid of what it’s doing to your handle time, but the really short calls where they just ask a quick question balance that out. I’ve been there just shy of 30 days, and I’m currently at 99% of my goal. The next way that you’re rated is by customer surveys. For every completed claim, you must ask the caller to take a survey, where they rate how well you did on a scale of 1 to 5. Your average on this one will change on a daily basis, because no matter how well you treat the customer and solve their problems, there are some people who just refuse to give all 5’s. Some people may be upset about the deductible or other policies and take it out on your rating, even though you have nothing to do with what they’re upset about. This is common practice in most call centers, though, and they understand that not every customer will give great ratings even though you did everything right. The goal is 76%, and I’ve had days where I’ve been below that as well as days where I’ve had 100% – it just depends on the customers you get that day. They also record all phone calls, so if there is an issue with something, they can go back and listen to the call and see if you did what you were supposed to. They also randomly do quality monitoring, where they listen in on your calls and rate you on all of the key points, such as knowledge, your tone throughout the call, whether you touched on all of the points that you’re required to, and things like that. I’ve had one so far, and I forgot a couple of points, so I got an 85% – you need 82.5% to pass, so it’s not too hard, and the more calls you take, the more it’ll become second nature. As with any call center position, they are somewhat strict about attendance, but they just recently changed the policy to make it easier to miss time and not be in fear of losing your job. You also get PTO time that accrues pretty quickly, but any time that you miss takes away from that, even if you would rather have the time unpaid to save your PTO for a vacation or something. They don’t allow you to have any unpaid time unless you are out of PTO time. One thing that does bother me is the way they have the downtime set up. If you have downtime because of Asurion system issues, you’re paid for that as usual. If you have downtime because you’re under a tornado warning and need to seek shelter, you get paid for that as well in order to be consistent with the brick and mortar location. However, if you’re having severe weather and it knocks your power out, it’s approved downtime, so you won’t get in trouble for it, but they pay you for it using your PTO time. This is not consistent with brick and mortar locations, because if their power goes out, they are still getting paid for the time they’re waiting for it to come back on, and if they decide to close that location, the reps are paid for the rest of the day. I found this out the hard way and was not real happy about it. Supposedly, they’re working on a solution for this, but we’ll find out. And if you have downtime for anything on your end, such as computer issues, failing to pay your phone or internet bill, or anything like that, it’s automatically paid out of your PTO time. The last thing I wanted to mention is overtime. I’ve heard that it’s available just about every week. This past week was the first where I was officially out of training and allowed to get overtime, and I got an extra 15 hours. If you see it available, you just sign up for it, and the system automatically approves it. If you do sign up for it, though, make sure you work it, because they are pretty strict about you voluntarily signing up for hours and then not working them. If you can’t work those hours for whatever reason, let your supervisor know that you’d like them to send out an email to see if somebody else is willing to work them for you. I’ve checked out the available OT for next week, though, and the only hours available so far are hours that I’m already scheduled for. It does change daily, though, so I may still end up with OT this week as well. Ok, end of my novel. If I’ve somehow managed to miss a point that you would like to know about, just add a comment, and I’ll try to answer it. Thanks so much for sharing your experiences! It seems like you enjoy the work, and I’m hoping you can offer more information. Do they offer part time hours? I seem to notice they have long shifts (when doing my research on the employee experience). Do you work from a desktop or PC? I’m a student living off campus, I could add a landline to my cable bill, but my internet is through a wireless router. Being that I’m a student, I’d like to work in the wee-morning hours, or late nights, do you think that would be suitable? I saw on the website they are seeking applicants in my state, though it never detailed full or part time, wish I knew a little more about hours before I pursued employment. I hate to bombard you with so many questions, thanks for at least reading, glad the job is working out for you! Is anyone here working part time for them? I was under the impression that i would be able to choose my schedule as long as i worked 8 hours on the weekend. Thanks do much for all the info Anna and others who posted their experiences. I had a screening interview with them yesterday and I’m supposed to contact them today for my second interview. BUT the rep didn’t give me the number to call and I did t even think to ask! If anyone has this info and could pass it along, it would be hugely appreciated! Ok, here’s the update that I promised. I’ve been in training for a week now. The training is done online – you need a computer headset, and you log into a room, where you interact with your trainer and mentors. There are some learning materials that you go over with quizzes built into them – you have to have an average of 90%, but they’re not too hard, and you have three attempts at each one if you’re not happy with your score. You also do some role-playing, where one of the mentors plays the customer and you play the CSR. The training seems to be pretty good at preparing you for most situations that will arise, although as with any job, there’s no way they can prepare you for absolutely everything that might happen. We’re supposed to start taking a few live calls this week, so we’ll find out how prepared we really are after the training, but at this point, I’m pretty confident. So far, everyone that I’ve had contact with has been very friendly and helpful. The hours aren’t the best (I’ll be working 12-9 on weekdays and 10-7 on Saturdays, so not much opportunity to do anything else on the side or even to eat dinner with the family), but from what I hear, there are shift bids that come up pretty regularly, and if you’re doing a good job, you can request a different shift at those times. The computer system is very user friendly, and your responses are for the most part scripted, though you don’t have to say it word for word, and there are a few points you need to remember to touch on that aren’t anywhere in the script. The benefits are awesome – they have really good insurance, and you only have to be there for 30 days before you’re eligible. They allow you to cover domestic partners of either gender, and there is no pre-existing condition clause. You also get discounts on tons of different things, from cell phone service, to printer ink, to travel, and tons of other things. Plus, if you move to a different area, in most cases, you can take your job with you (there are some exceptions, but from what I’ve heard, they are few and far between). Anyway, to sum it up, at this point, I’m pretty hopeful that I’ve landed in a good place. Any job has it’s ups and downs, but so far this seems to be a good place to work. I’ll update again after training is over and I’ve been on the job for a while. Thank you so much for all this detailed info! I know it will really help out everyone considering this company. The benefits do sound amazing! Good luck Theresa. I hope you continue to be pleased with the company! Thank you, Anna. And thank you for listing the job as well – without you, I would never have known the job even existed. Love your site and use it often to check for things I might be able to do on the side (just started mystery shopping as well, again thanks to your information). I’ll post another update in a couple of weeks!!! I also had three interviews with them. No problems with them calling me. Don’t forget the time difference. They work off of CST and I am EST so it was always one hour after the said time. I start training (PAID!) tomorrow (Feb 20.) I am so excited. I got the email with the schedule for training (three weeks.) My training is M-F 1pm – 10pm. I will post again to let you all know what I think. So far everyone is very friendly and helpful! I would love to know some of the questions asked during the interviews. I’ve read that one of the interviews is long. The first interview is basically just a screening process – they ask you about your computer knowledge, customer service background, that sort of thing. That one didn’t take too long. The second one was the longest – they said it would be about 30 minutes, but mine was 51 minutes. In that one, the questions are mostly “tell me about a time when you……..” – basically just questions that see how you handle certain situations. As far as the specific questions, I’m seriously drawing a blank – I’m sorry. But I think that they have a list to choose from, so I don’t think the questions are the same for each person, anyway. The third interview took about 30 minutes. First, the lady explained about the job – stuff about the company, what kind of calls you can expect to take, benefits offered, stuff like that. Then she asked me 4 questions, and for this one, I know she had a list to choose from, because she told me on the last question that she was having a hard time choosing the last one because the way they were worded, I had already answered most of them in my answers to the other 3. I’m sure there’s more than one person who does the final interviews, but my lady was really nice and could relate to just about everything I said, which made it probably the best interview I’ve ever had. The only specific question I can remember throughout the entire process was in the final interview, where she asked me to name a time when a customer or co-worker asked me to do something that was unethical, how I handled it, and how I felt about the decision I made. That was also the hardest one, in my opinion – I really struggled to remember something like that, but I finally did, and she was really happy with my answer. Anyway, I know I didn’t completely answer your question with specific questions they ask you, but I hope I at least helped a little bit. Does Asurion work from home do background checks? Thanks Teresa! I will call them. I applied at Asurion and had 3 telephone interviews. For the first one, I wasn’t home when they called, so when I called back, they did the interview immediately. During that phone call, they scheduled the second interview. As mentioned above, nobody ever called, so I called them again, and they did the second interview right then. At the end of that interview, I was scheduled for the next interview, which was supposed to be the following day. Again, nobody called, so I called them. This time I was told that there was some sort of glitch in the system and that someone would have to call me back to reschedule the third interview. This time I did receive the call on time, and the interviewer was a super nice lady. The very next day after the third interview, I received a call telling me that they wanted to offer me a position. I start on February 13, so I can’t say anything about how the job is yet, but I’ll post once I start training to let everybody know how it’s going!! Just wanted to add one more thing – the article mentions that the pay is between $10 and $12 an hour, but it actually starts at $9.00 per hour for daytime hours, and anything you work after 5:00 pm is paid at $9.50 an hour. Thanks for the info Theresa. I finally got around to correcting this in the post. Hi Theresa, thanks for all the info! I’m supposed to interview a second time with them today but don’t have their number to call (she forgot to give it to me and I forgot to ask). Would you happen to still have it on hand? Hi Kasheia. I’m sorry – I don’t have that number anymore. They actually have another company (Peoplescout) that does their hiring, and I don’t have that number anymore. You can send an email to one of the hiring people, though. Well, no one called me at the scheduled time. This isn’t Asurion’s fault. They outsource their HR to PeopleSoft. I’ve read that many others have had this problem too. I will report back once I have something to share. Sorry they didn’t get back with you when you thought they would, Erica! Hopefully you will hear from them soon though. Good luck on your interview 🙂 Thank you for updating me on how it’s going, the info is very helpful to have posted here for others who are thinking of applying. That happened to me too but I did reapply and I was hired. Everybody is very much professional and you have to pass several tests before you get an offer. yes it is a great place to be ! I had the same problem with my second and third interviews. For the second interview, I just called them, and they did the interview right then. For the third one, they told me that there was a glitch in the system and someone would have to call me back to reschedule. They did call a couple of days later to reschedule, and this time I got the call on time, and I ended up being offered the position. You might want to call them to get the ball rolling. Hope this helps!!! I applied on Dec 8 and yesterday I was called. I have an interview this morning. From what I’ve read, there are 3 interviews. I will post more after the interview. This sounds like a good one. I know there are many work at homers that want an employee position with benefits. Great job review Anna! I have heard of this company over and again but for some reason it was one I kept overlooking! Definitely looks like a good opp! Sometimes I wish I could do a phone job. Best of luck and awesome review, Anna! Thank you!! Sometimes I wish I could, too Jess. I have thought about signing up for Pierce Eislen several times when they start hiring for fall since they are OK with background noise. This sounds like a really good opportunity for those who live in the certain states. I wish everyone luck that applies!